For nine years in a row, Apple has been the most innovative company on the planet. That designation comes care of Boston Consulting Group, the elite consultancy. Since last year’s list, Google climbed over Samsung to take the second spot, sliding the South Korean manufacturer into third. Three companies vaulted into the top 50: The Japanese conglomerate Hitachi landed at No. 37, Marc Benioff‘s SalesForce.com landed at No. 40, and the Chinese phone maker Xiaomi made it all the way to No. 35. Automobiles saw the biggest drop-off of any industry. A full 14 made the 2013 list, and that number fell to just nine this year. 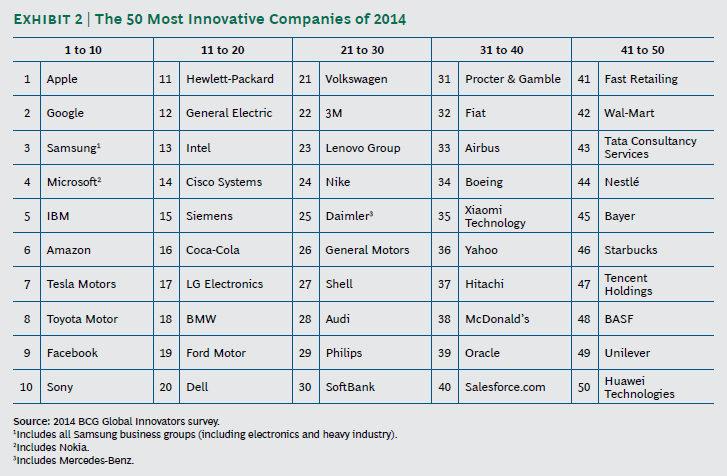 Every year since 2005, the firm has surveyed more than 1,500 senior global executives for a snapshot of the most innovative companies in the world. Each executive is asked to rate the companies in their industry by how innovative they are, and those results are then weighted to reflect three-year shareholder growth, revenue growth, and margin growth. Author: Drake Baer reports on strategy, leadership, and organizational psychology at Business Insider.